Sticky rice cooked in coconut milk and chocolate. Champorado is the ultimate breakfast sweet treat. Serve with ice cream and it’s a yummy dessert! Back in the Philippines, I remember those lazy Saturdays when you can get up later than usual, have a leisurely breakfast and just relax. For those days, what I fancy is a piping hot bowl of one of our classic Filipino breakfasts — Champorado or chocolate rice porridge (yes, we do have a breakfast dish that doesn’t involve fried rice or eggs or even meat….yes, admittedly there is rice but at least it’s not fried!). Who can resist chocolate rice? I can’t! This version is more luxurious than the traditional champorado! The usual champorado is simply cooked in water and flavored with cocoa powder or chocolate tablet called “tablea” and sweetened with a little sugar. In fact, when my hubby tasted it he thought I should serve it more as a dessert rather than as breakfast. Oh well, for me it’s good either way! Instead of using just water to cook the rice, I added a combination of coconut milk and evaporated milk at the end for extra creaminess and taste. It came out really yummy and enhanced the flavor of the chocolate. It was totally more-ish!! 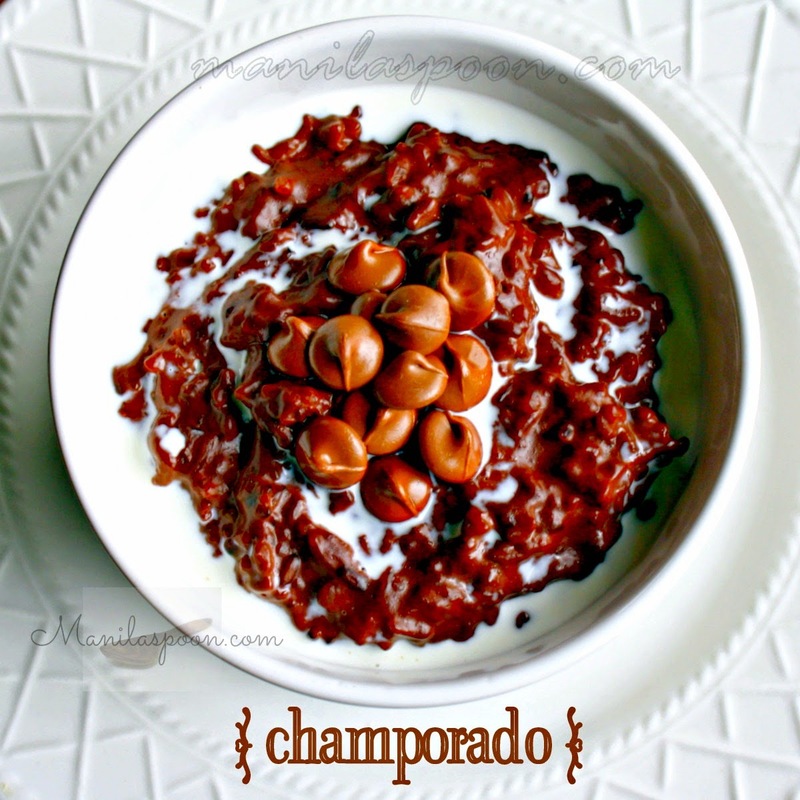 Enjoy this champorado either at breakfast or after a meal as a dessert. Top it with with vanilla ice cream or even chocolate chips if you are feeling really indulgent! Wash and drain the rice well. Place in a large deep pan and mix with the unsweetened cocoa powder. Pour in the water and stir. Bring to a boil. Once it starts boiling, adjust heat to low, cover and cook, stirring occasionally, until the liquid has mostly dried up and the rice is tender about 30-40 minutes. Pour in the evaporated milk and coconut milk. Add the brown sugar and chocolate chips. Stir until everything is combined and the color is even. Continue to cook uncovered for another 10 minutes or so on low to medium heat, stirring occasionally, until the consistency and thickness is to your liking and the milk has been fully heated through. If it’s too thick simply dilute with a little water or milk. Adjust sweetness to your taste. Serve in individual bowls with additional milk and sugar on the side and perhaps a few sprinkling of extra chocolate chips! Traditionally, we eat it with dried salted fish. But, you don’t have to! For dessert, serve warm and top with vanilla ice cream. Enjoy! If you like what you see and would like to receive new recipe updates, we’d love you to join our site or like us on Facebook. Thank you so much for dropping by! Have a wonderful time browsing! Enjoy this yummy chocolatey treat! This looks so good. I have pinned it for later use! Thank you so much for bringing this wonderful recipe to my Birthday Party on facebook! Thanks, Cynthia! Glad you like it. Good for how many people? I would guess 4-6 or perhaps more…depending on how big the serving bowl is too. Would I be able to convert to dairy free? I don't see why not. Perhaps you can try rice, almond or soy milk. I just don't know which one will taste better. Could I use CalRose rice? My mother in law is always telling me how her mom made chocolate rice for her breakfast. She says it was because they were farmers and poor, but this looks decadent! I would love to bring back memories for her (she's filipino) as she glows when she recounts the memories of her mom doing this but I only have half and half and heavy cream and almond milk on hand. And CalRose rice. I know the rice you're talking about as we use it for Biko (spelled wrong I am sure) and also I have brown rice. Also, any chance of making this in the rice cooker? You can try half and half and cream, am sure that's fine. I haven't tried regular rice with this, I believe sticky rice is always used for this. I would suggest cooking it in a regular pot/sauce pan 'cause unlike regular rice, the liquid should not fully dry but when you decide to try it as you have suggested do let us know how it went. Thanks! I have never made rice pudding, but I think I will try this recipe – sounds so natural and delicious too! It is definitely worth a try! Thanks! Delicious!! My husband spent two years in the Philippines on his mission and used to have this for breakfast sometimes. We made it tonight and our whole family loved it! We had it as more of a dessert and so used the full can of coconut milk and evaporated milk. Plus I had to add quite a bit of regular milk as it was cooking because it was getting so thick. We served it with extra milk and a few chocolate chips on top (like your picture) and it was excellent! We'll definitely be making it again. Thanks for the recipe!! 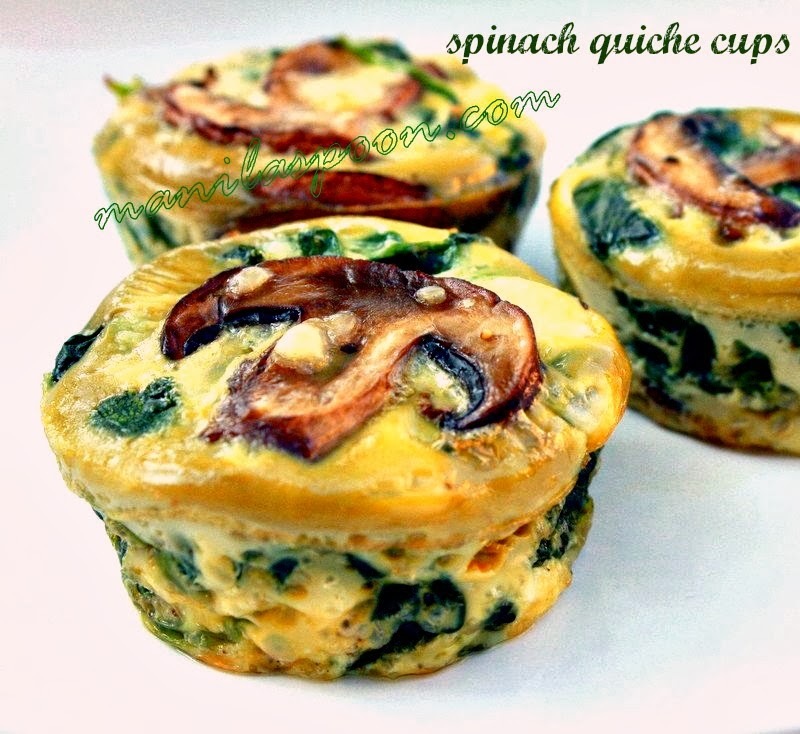 Robin, I am so delighted to know that you enjoyed the recipe with your family. It must have been like going down memory lane for your husband when he had champorado. Hope you and your MIL enjoy this! Thanks for the story too. What a memory! End result was really good! I had to add an additional 3 cups of water throughout the cooking process as it would have burned and been a mess. I cooked the rice for 30 minutes but if I did 40 I would have added another cup of water. The water absorbed almost immediately. I’ve never made it from scratch before and I am definitely impressed and I hope my husband (who is Filipino) will be too. I’ve had this recipe saved for at least a couple years, I think. Well, tonight I finally made it and WOW! We are snowed in but I made sure to get everything for this decadent dish. We are having for dessert and again for breakfast. This recipe is a keeper and I’m so happy I made it. Thanks for sharing!! We love it!! !